Outside The Frame Was A Smashing Success! 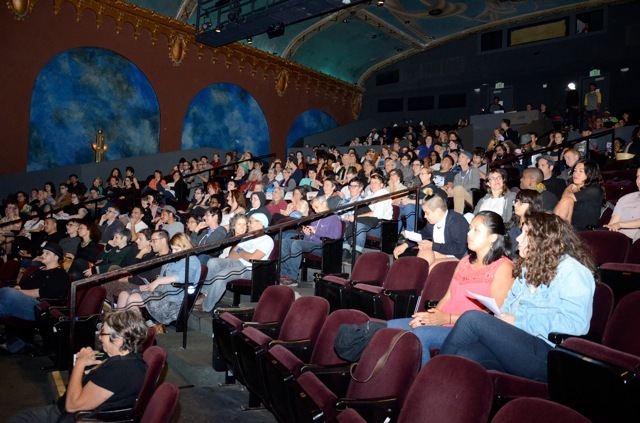 Over 800 people attended Outside the Frame: Queers for Palestine Film Festival during the weekend of June 19-21, 2015. 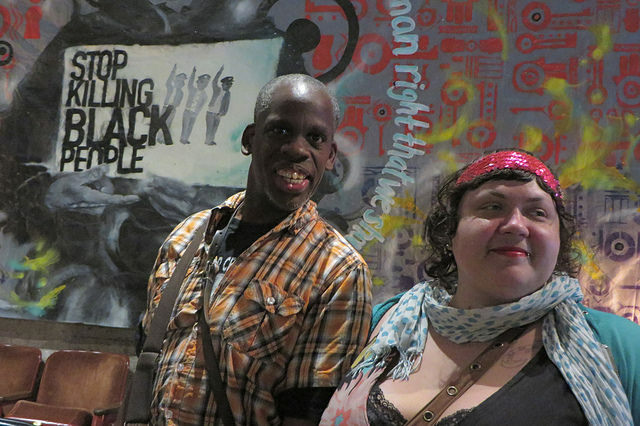 The free festival at San Franciscos historic Brava Theater was conceived as a radical alternative to Framelines annual SF LGBT film festival and a protest of Framelines longtime partnership with the Israeli consulate. OTF presented a wide range of outstanding work created by film makers who declined to screen their work at Frameline as long as it continues to defy the international call for Boycott, Divestment and Sanctions against Israel (BDS). The festival kicked off Friday night with a packed house for the Bay Area premiere of CRIMINAL QUEERS, a farcical takedown of the prison industrial complex, directed and produced by Eric A. Stanley and Chris Vargas. 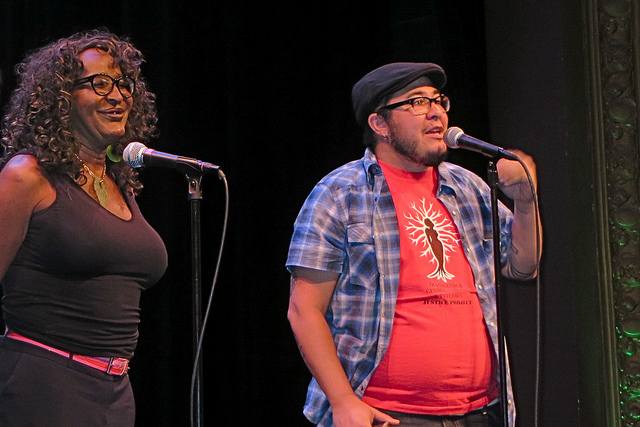 The show, hosted by the charismatic Star Amerasu, brought down the house, raised over $400 for the Transgender and Intersex Justice Project, and set a great tone for the rest of the weekend. Other offerings throughout the weekend ranged from the comical (Hey Elton, John Greyson's video letter to Elton John) to the whimsical (Ill Nipashi's Different Strokes, the little known story of the role of women, people of color and queers in the formation of biker culture) to the tragic, (High Hopes, Guy Davidi and Angela Godfrey-Goldstein's expose of the forcible displacement of Bedouin refugees under Israeli occupation). Saturday night's The Passionate Pursuits of Angela Bowen, Jennifer Abod's film about a Black lesbian ballet dancer, educator, activist and scholar, accompanied by other short films on the relationship between gender and creativity, delighted and inspired. 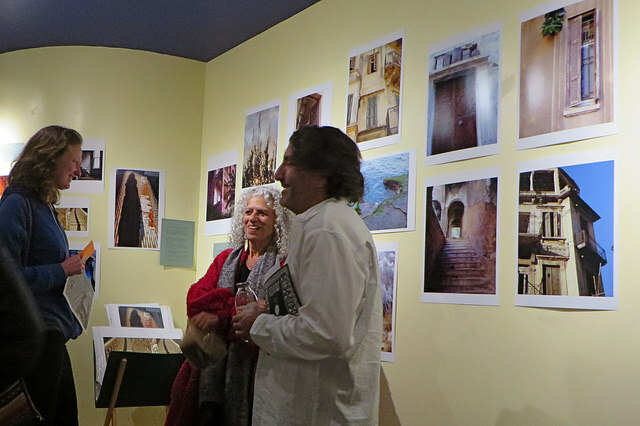 Sunday's audiences were deeply touched by portraits of Lebanese queers in Maher Sabry's THE PATH TO COMING OUT and the journey of an undocumented Mexican immigrant to the US in Ana Simes' and Bassam Kassab's SIN VISA, and beautifully challenged to reconsider stereotypes about disabled people and sexuality in SINS INVALID. Saturday afternoons screening and discussion with director Dean Spade and participants in the documentary PINKWASHING EXPOSED, about the movement building work of Queers Against Israeli Apartheid in Seattle, joined by Bay Area anti-pinkwashing activists, was a rich and well-attended centerpiece. We were so happy to get to know these fantastic activists and look forward to working with them in the future. Audiences were racially and generationally diverse. Two fabulous art shows, by Art Forces and Happy/L.A. Hyder, made the lobby a destination. Tablers from AROC, Sins Invalid, Art Forces and Just World Books held it down through Saturday and Sunday, and people loved browsing Queers Undermining Israeli Terrorism (QUIT!) historical BDS paraphernalia (Estee Slaughter perfume samples, Victorias Secret Weapon catalogs). Outside the Frame was truly a community effort. We partnered with more than 20 sponsoring organizations, who helped with outreach and recruited dozens of volunteers to make everyone comfortable. We were able to offer ASL interpretation and captioning for half the programs. Thanks to the generosity of Resist!, Sisters of Perpetual Indulgence, the Peoples Life Fund and Brava, as well as numerous individual donors both before and during the event, we ended up with a small surplus which we have distributed among several local and Palestinian organizations. The festival was proud to present such an amazing array of creative independent films and to recognize the film makers principled stand against Israeli apartheid. The BDS movement's momentum is accelerating and we were thrilled to be part of that expression of cultural solidarity! Over 40 filmmakers signed a pledge not to screen at Frameline or the Vancouver Queer Film Festival until they meet the demands of their communities to stop pinkwashing Israeli apartheid. We screened five features and 19 short films, from Canada, US, and Palestine. For the first time since 2007, Frameline representatives met with BDS activists and had to look directly into the faces of people who are hurt by their policy of supporting apartheid. Frameline had at least three direct meetings that we know of on the issue, one with filmmakers who were considering pulling their film from distribution, one with an independent group of Jewish lesbian artists, and one with representatives from Mithyleen (Bay Area Arab Queers for BDS), QUIT! (Queers Undermining Israeli Terrorism), Arab Resource & Organizing Center, American Friends Service Committee, Gay Shame and Outside The Frame. For the first time in six years, Frameline did not have Israeli sponsorship at this years film festival. Although they said that this was simply because no Israeli feature films were selected for screening, we believe the increasing negative publicity from our campaign and the focus provided by Outside The Frame influenced their choice. Several other cultural and film organizations, Arab Film Festival, Other Cinema and Golden Thread Middle East Theater, expressed support for BDS by cosponsoring Outside The Frame. 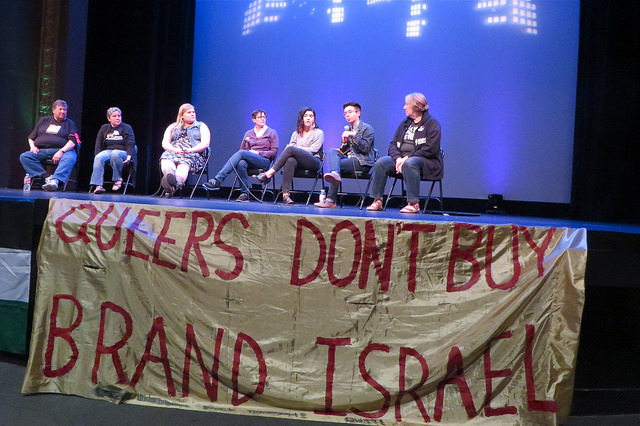 At least two filmmakers spoke about BDS from the Frameline stage. We followed up the film festival with a small but spirited pajama protest (Frameline: Get Out of Bed With Israel!) outside the screening of Love Island at the Castro Theater on Thursday, June 25. The protest was accompanied by projections on the wall of Diesel, across the street from the theater. The response from passersby was overwhelmingly positive, in sharp contrast to previous years. We distributed over 5000 post cards and 300 posters and were featured on numerous local calendars, as well as four radio shows. This means thousands of people learned about pinkwashing, even if they did not attend the event. Thanks to all of our cosponsors. We could not have done it without your help! Queers Undermining Israeli Terrorism (QUIT! ), Mythiliyeen-Bay Area Arab Queers for BDS, Gay Shame, Against Equality, Aswat Palestinian Gay Women, LAGAI Queer Insurrection, SWANABAQ (SouthWest Asian & North African Bay Area Queers), Queer Women of Color Media Arts Project, Arab Film Festival, Arab Resource & Organizing Center, Art Forces, Critical Resistance, Golden Thread Middle East Theater, International Jewish Anti-Zionist Network, Jewish Voices for Peace - San Francisco/East Bay, KPFA Womens Magazine, Middle East Children's Alliance, Other Cinema, UC Berkeley Students for Justice in Palestine, US Campaign to End the Israeli Occupation, Voices of the Middle East & North Africa and KPFA-Pacifica Radio.